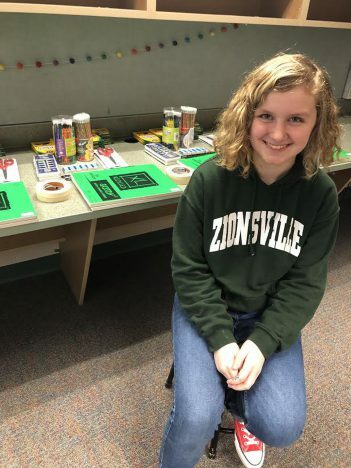 Ella Nooning, a 14-year-old eighth-grader, is one of the hardest-working students at Zionsville Middle School, according to her art teacher Jennifer Gibson, who has taught at ZMS for 17 years. Gibson said Nooning decided to write a grant because she noticed a need for additional student resources, such as the art materials that make up the ‘art cart.’ The $500 grant allows for four of the art carts to be assembled placed in grade-level resource rooms. The art supplies are on a cart for portability so that they can be easily delivered to a student in distress. “I know that middle school can be really stressful and cause a lot of anxiety, because it has for me,” Nooning said. “But art has really helped me, so I wanted it to help other students, too. Gibson was impressed by Nooning’s ability to form an idea for the grant and her ability and drive to create a PowerPoint-funding spreadsheet and presentation for Zionsville Education Foundation director Lyle Browne. Ultimately, the grant wasn’t funded by ZEF because it funds teacher-inspired grants, but Nooning’s grant was funded by the Zionsville Educational Services Center. Gibson said Nooning has overcome a lot of obstacles, and art therapy has been a huge part of her story.